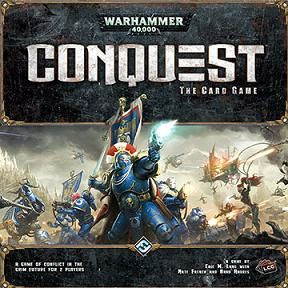 Warhammer 40,000: Conquest is a two-player Living Card Game of interplanetary warfare in the gritty futuristic setting of Warhammer 40,000. By hurling you into a life-and-death combat for the Traxis sector, Warhammer 40,000: Conquest forces you to secure your hold over the sector`s key planets. You must balance the concerns of present battles and future conquests as your warlord leads your armies to glorious victory. To claim the Traxis sector, you must conquer or die.